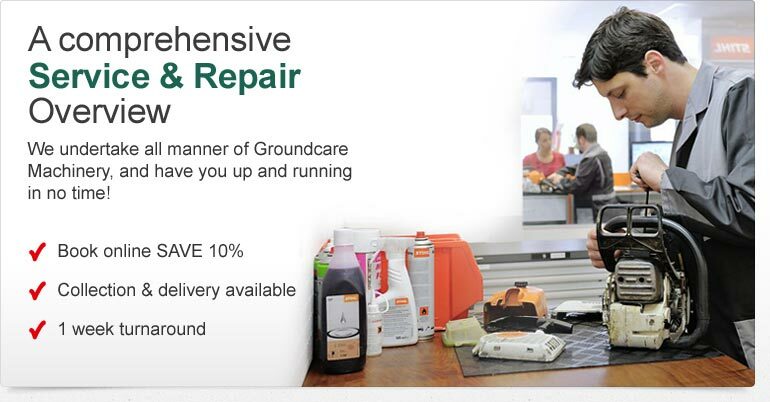 Use the booking form or call us on 020 8908 4744 for a free estimate. Gayways Ltd service centre provides lawnmower and garden machinery servicing and repairs to customers in Middlesex, and surrounding areas. Gayways Ltd has been servicing garden machinery since 1975. With experience gained from contracts with large sports facilities, local schools, and Local Authorities, we are well placed to deliver a reliable service for all types of garden machinery from hand machines to pedestrian lawnmowers to ride-on lawn tractors. What types of machinery do we Service & Repair? At Gayways, we Service & Repair many outdoor machines, weather its Petrol, Electic, Battery Powered, or Diesel. Our Service Engineers are trained in all manner of small engine Service & Repair from Lawnmowers, Cylinder Mowers, Ride On Tractors, Chainsaws, Blowers, HedgeCutters, Strimmers, Brushcutters, Concrete Disc Cutters, Generators and more. How does the Service & Repair work? 1. Come and visit our workshop/showroom in either Harrow or Tenterden Branch. A member of our staff will book in your machine(s), and Customer details. The more machine details we take the easier it is for our engineers to work with ordering Parts (if any). The added benefit to our customers is that we keep all history of Service and Repair for each customer, knowing exactly what was undertaken in the past, and knowing what repairs had been done. 2. If its cost effective for you, you can send your machinery via courier. Transport cost are customers responsibility. (Customer is liable for any damage in Transit). 3. We can arrange Collection of your machine, and deliver back. (30 mile radius from our depos). If you intend to Courier your Machine/ Tool, please send your equipment to the following address, clearly marked for the attention of the repairs department. If your are unsure of anything at this stage, please contact our repairs department on 020 8908 4744. Once our Service Department have received your equipment(s) and the inspection fee, we will arrange for our engineers to carry out a thorough inspection completing a detailed report usually within seven working days. We provide you with a detailed quotation along with a quote in some instances for a comparable price on a new unit. If you decide to go ahead with the Service or Repair, we will require a confirmation via phone, email, or fax. If the tool is beyond economical repair, and you would like it returned back via Courier(disassembled) then a carriage charge will apply. If the item was Collected by us, then we will deliver your item back to you (disassembled), at no extra cost. See Collection & Delivery below. Once we have received authorization, the Service or Repair can be carried out. We cannot guarantee a timescale for the repair as Parts may be required. Most Parts are usually available within five working days. In exceptional circumstances we may request a further deposit before repairs are undertaken. When the Service & Repair has been carried out, we will notify you by phone, or email, to let you know, and you can arrange to pick up at your own convenience. If the item has been sent in to us via Courier, we will arrange with our Courier to send back to you. Courier cost will be extra. If we have collected the Machine/ Tool with our own vehicles, then we will deliver back to you. All completed Serviced & Repair jobs will need to be paid in full before releasing your item. If you are still unsure about anything, you can email us at service@gaywaysltd.co.uk. We aim to respond within one working day. Alternatively you can call us on 020 8908 4744. Please note- Once a member of Gayways have notified you as the customer, you will have 2 weeks from notice to arrange to collect your Machine(s)/ Tool(s). After 2 weeks, we will charge for storage at £10 per day. Any equipment left with us for more than six weeks after repair, or are not required will be disposed of, or sold. Call our Service/ Repair Team on 020 908 4744 or submit the Online Booking Form to and one of our members of staff will call you back to make sure everything is correct, and discuss the next stage. Our quotes are bespoke to individual requirements to ensure best value. 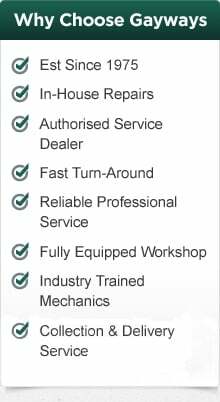 (Discount is subject to all machinery booked in and are 'Fully Serviced or Repaired). Gayways Ltd gives each and every garden machinery job the same care and dedication as we do our own fleet of professional grass machinery. Our team of mechanics are trained to the highest standards to ensure your machinery is in top condition. We can also arrange a free collection and delivery service for your machinery from locations within a reasonable distance of our service center. All servicing and repairs carried out are done so in accordance with the manufacturer’s requirements, with all work carried out guaranteed.